This book has been written to mark the 50th anniversary of SETI, and gives the author’s personal thoughts on why no alien signals have yet been detected despite the ever increasing sensitivity of the search. It is intended for a popular audience, and as such doesn’t provide much new information that anyone familiar with the SETI literature won’t already know. Nevertheless, it is a thought-provoking book, and I am glad that I read it. Its main strength is a plea for a more broad-minded, less anthropocentric, approach to SETI. Davies believes, and I agree with him, that much of the current approach to SETI, and indeed to the search for life elsewhere in the universe more generally, is naïvely predicated on the expectations that intelligent aliens, if they exist at all, will be more or less like us. Of course, no one (with the possible exception of Simon Conway Morris – see his book Life’s Solution: Inevitable Humans in a Lonely Universe, CUP, 2003) believes that intelligent aliens would look like us physically, but still the expectation is widespread that ‘they’ will have similar intellectual interests and similar (albeit more advanced) technologies, and that this will lead naturally to interstellar radio communication as the preferred means of contact between intelligent civilisations. Davies argues that this may be leading us to miss other possible signs by which alien intelligences might be detected. Davies develops this argument well, but it is also apparent that, no matter how broad-minded the search, he doesn’t really expect that it will be successful. This is because, reluctantly, he comes to the conclusion that intelligent life is probably very rare. Indeed, he concludes that “we are probably the only intelligent beings in the universe, and I would not be surprised if the solar system contains the only life in the universe.” He arrives at this rather dispiriting conclusion from two mutually supporting considerations: (1) what he sees as the intrinsic difficulty of evolving life from non-life; and (2) the complete absence of any sign of intelligent activity in the Galaxy, and in particular the fact that life has been allowed to evolve on Earth for billions of years without interference from outside (the so-called Fermi Paradox). I agree with this analysis up to a point. However, whereas Davies seems convinced that the initial origin of life (i.e. fl in the Drake Equation) is the major stumbling block (hence his suggestion that life itself may be unique to our Solar System), it seems to me that the early appearance of life on Earth argues against this conclusion. Davies rejects the ‘early appearance of life on Earth’ argument, pointing out that it is not possible to draw general conclusions from only one example. In this he is of course formally correct. Only by surveying many other planetary systems for evidence of life, and/or identifying multiple origins of life in our own Solar System (the importance of which Davies is at pains to stress), will we be able to form a realistic estimate of the probability of life emerging from non-life. There is, however, another possible explanation for ‘the eerie silence’ — that the limiting factor in the Drake Equation is not fl but fi (the fraction of inhabited worlds that develop intelligence). Evolutionary history of life on Earth shows that the evolution of intelligence rests on a large number of improbable yet contingent evolutionary steps (e.g. the evolution of the eukaryotic cell, and of multi-celled organisms) that may not be repeated elsewhere (something pointed out over a century ago by Alfred Russel Wallace in his book Mans Place in the Universe, Chapman and Hall, 1904). It is therefore possible to envisage a universe in which life is common but complex life is rare, which would also be consistent with the Fermi Paradox and the lack of success with SETI. Davies does touch on these issues, but seems to shy away from the possibility of a universe that is full of life but lacking in intelligence, in favour of one where life itself is rare. For what it’s worth, and for reasons given in detail elsewhere (see Astronomy & Geophysics, 38, 4.24, 1997), my own view is that the former scenario is the more likely. Only further exploration of the Universe, including the extension of SETI into some of the new directions suggested by Davies, will reveal which, if either, of these scenarios is actually correct. 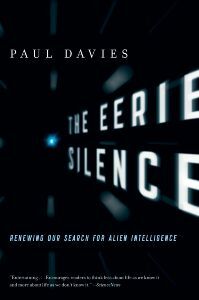 Davies, of course, freely acknowledges this – his book is in essence a plea for more data on which firmer conclusions about the prevalence, or otherwise, of extraterrestrial intelligence can be based. All of us must share that objective.